The Heart of Florida’s Emerald Coast is home to sugar-white sand, crystal clear water, and beautiful sunsets. 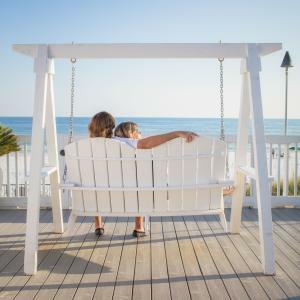 Destin, Fort Walton Beach, Okaloosa Island is the perfect setting for your next romantic getaway. Discover all that the Emerald Coast has to offer...together! The Henderson Park Inn was named the Most Romantic Hotel in North America and lives up to the honor! The beachside bed and breakfast sits adjacent to Henderson Beach State Park which allows for stunning views of the Gulf of Mexico. While staying at the Henderson Park Inn you will enjoy charm and luxury with elegantly decorated rooms and an adults-only policy. Admire the sunset from your private balcony or have a cozy evening alongside the fireplace in your private suite. As a guest, you also receive access to amenities at The Henderson Resort. There is plenty to enjoy with your loved one at the Henderson Park Inn and experiencing Beach Walk Café is a must! Beach Walk Café is Destin’s only fine dining establishment on the Gulf of Mexico and calls the Henderson Park Inn home. A perfect date spot, the dining room is intimate and romantic. Partake in mouthwatering dishes such as Grouper Vince (namesake from the country star, Vince Gill) and Grilled Ahi Tuna. Another lovely date night spot is The Boathouse Landing which is located in Valparaiso. Offering seafood, steak, and pasta with a peaceful view of Boggy Bayou. Share a delicious appetizer of Boathouse’s Boom Boom Shrimp and enjoy dinner selections such as Canjun Bayou Pasta and Cobia & Shrimp Étouffée. After dinner, make your way downstairs to the Bilge Pub for a perfect cocktail and live music. While visiting the Emerald Coast on your romantic getaway take a moment to peruse the Mattie Kelly Arts Foundation’s schedule of events for a unique date experience. As host to Concerts in the Village and Festival of the Arts there are many opportunities for couples to enjoy the arts on the Emerald Coast. Another date night option is a relaxing and beautiful sunset dolphin cruise aboard the Southern Star, or simply take a stroll hand-in-hand on the pristine beaches of the Emerald Coast.